I don't know how you can write a sentence like that with a straight face. I had to read it at least six times and I still can't stop laughing. If you're curious about how Jay-Z took this totally nebulous statement, he was pissed, infusing the byte with perhaps more clarity than the situation called for: "I view his comments as racist and will no longer support any of his products." AdRants puts it well when it muses, "Jay-Z called Cristal's almost-compliment about him mentioning the brand in his lyrics racist. What now, smiling at someone the wrong way is racist?" In other news, Cristal falls from spot 7 to spot 8 as hip-hop's swig of choice according to National Brandstand, which tracks how often brands get name-dropped in popular tracks. In what's been called the "most significant repositioning effort" in the company's 55-year history, Dunkin' Donuts has launched a fresh campaign under the tagline "America Runs on Dunkin'." The campaign vibes fun-loving American quirkiness, sunshine and smiles and the good, ol' Protestant work ethic that brought us all here - an appropriate position, considering it aims to "[invigorate] the hard-working people that keep America running day-to-day," according to to John Gilbert, VP of Marketing at Dunkin' Donuts. Since its acquisition by a collective of private equity firms last month, Dunkin' Donuts has been pursuing an ambitious campaign strategy with the intention of tripling its reach in the next ten years, aggressively targeting the West in particular, where Dunkin' Donuts franchises are few and far-between. I've kept Dunkin' Donuts in my periphery for the last few months because I began to suspect early on that it's making waves in the waters of that green mermaid we all know and love. I say this because it doesn't even try to whoop Starbucks in its own chic arena, a mistake many other purveyors of "fine coffee" have made, leaving them looking like cheap imitations in the shadow of the Big Green. While Starbucks has made a niche out of its third-place policy, creating an elegant environment for the type of people who get a kick out of saying words like "tall, grande, venti" to the croons of Michael Bublé, Dunkin' steers its course in the opposite route, emotionally connecting with the av'rage Joe who might feel a little weird walking into barista-ville with paint-speckled jeans. He doesn't want to reinvent the (perfectly suitable) terminology for small, medium and large. The soundtrack to his life probably won't include heavy helpings of Sinatra and Ella Fitzgerald. He just wants a good, unpretentious caffeine fix before going back to making an honest day's living. And have you met anyone who's had a cup of Dunkin' Donuts coffee? It's a bit like a religion - one of those quiet religions, the likes of which carried the spirits of Netflix and Diesel before they possessed the public cachet they do today. I have friends who actually order out to the East Coast for Dunkin' Donuts beans because we haven't got a franchise nearby. I can hardly say the same for Starbucks, which isn't exactly known for great-tasting coffee. Don't get me wrong. My love affair with Starbucks has lasted almost a decade. I fell in love with the green aprons, Italian sizes and holiday lattés laced in foam. It did a beautiful job of bringing a pseudo-European café experience to a prototype American that was otherwise indifferent to his or her paper-encased black puddle. Starbucks converted espresso education and complex, finicky orders into serious cultural capital. But the wind changes, and in a world gone mad, the day dawns for an America that represents the simpler things. Amidst polarizing politics, confusing wars, the growing worthlessness of an increasingly costly undergrad education, and sports heroes on steroids, we're too tired to play the caffeine elitist. What anchors us to shore? What reminds us of our roots, our worldview, our very raison d'être? A marketing undercurrent that whispers, "America runs on Dunkin'." Av'rage Joe wants to go back to saying, "A cup of coffee, please." But now it's an emotionally charged statement that means something different than it did before Starbucks turned coffee into high culture. With the dawning of the Dunkin' Donuts age, the old statement ties us back to Americana - the apple pie values comprising a hard-working bunch of people who are just trying to work out that "pursuit of happiness" thing. When that small, simple request slips out of your mouth, it's a little uplifting to know you've anchored yourself back to all that. So keep your eyes on Dunkin' Donuts. In far less than ten years, it's going to contribute to a serious cultural shift. Caffeine-wise, anyway. 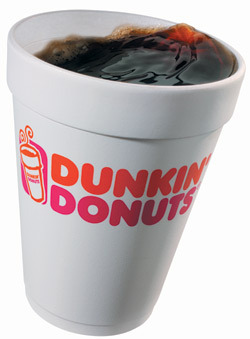 The "America Runs on Dunkin'" campaign was developed by Hill, Holiday. Days after the news of good friend Gates' retirement, seventy-five-year-old Warren Buffett, the second-richest man in the world, announced he'll be donating 85% of his fortune to charitable foundations. The bulk of this donation, This marks the single largest donation anyone in the US has ever made, trumping the monetary contributions of Carnegie and Rockefeller, even accounting for inflation. It also highlights the intimate friendship that has existed for years between Gates and Buffett. Of course, no good deed goes unpunished and Buffett has his critics. There remain a few who feel he's provided his children with too much of an advantage, despite the fact that they lived out relatively normal childhoods in Omaha and aren't lifting a finger to contest the whoppin' $37 billion of dad's money that's not going to them. He's allotted them stock in the illustrious Berkshire Hathaway and has enabled them to devote much of their lives to charitable work. In 2004, his son Peter Buffett and wife Jennifer each received a $40,000/year salary for 30 hours of charity work per week within the family foundation. I'd hardly call this cushy, but I suppose there's always reason to nitpick. Inherited wealth makes me rather uncomfortable, and that's hardly a unique sentiment. Even King Solomon, the Bill Gates of his own time, laments this problem: "I hated all my toil in which I had toiled under the sun, seeing that I must leave it to the man who will come after me; and who knows whether he will be a wise man or a fool?" (Eccl. 2:18-19) All you need to do is turn the television on to witness the countless kids who've made a mess of their lives with mom and dad's money. Acknowledging the same discomfort (he's been known to say inheritances are privately funded food stamps), Buffett gave his kids a grander gift than madd bills: he enabled them to mold their own futures and make their own decisions about money. (Therein lies the power of getting stock and not cash.) How do you know your kids have internalized your respect for the dollar? When you can let go of 85% of your fortune without a one of them raising a finger to stop you. "Love is the greatest advantage a parent can give," Buffett says in the Fortune story that broke the news about his donation - a sentimental notion, but one many can relate to. The gift of character is infinitely more valuable than a signed check you didn't earn. Buffett made the majority of his money through the stock market, following mentor Benjamin Graham's philosophy of securities analysis and his own contrarian guidelines. He is worth an estimated $44 billion according to Forbes, just a few billion shy of Gates' $50 billion. Like Gates, who has been without question the spearhead of Microsoft from its inception, Buffett's fortune was carved with a sense of passion and deep propriety: "I get to do what I like to do every single day of the year," he says. "I get to do it with people I like, and I don't have to associate with anybody who causes my stomach to churn. I tap dance to work, and when I get there I think I'm supposed to lie on my back and paint the ceiling. It's tremendous fun." His annual reports to Berkshire Hathaway shareholders read like letters to close friends, demonstrating his enthusiasm for his work. In a letter to Gates and his wife, Buffett writes: "You have committed yourselves to a few extraordinarily important but underfunded issues, a policy that I believe offers the highest probability of your achieving goals of great consequence." Even in contributing to charity he follows the principles of securities analysis, investing deeply into an undervalued (in this case, underfunded) niche. He also lends insight into value of a different kind: that with great fortune come significant responsibilities within the world - larger ones than most people will encounter in their lives. For a full and satisfying life, it's critical to take care of your money the way you would a well-kept garden, keeping it circulating in productive arenas to prevent it from stagnation, thereby ensuring a rippling sustainability beyond yourself. Following your dreams doesn't just enrich you; it enriches everything you touch, as it should. By no means do I think social responsibility should be imposed by outside forces upon the man who takes the plunge into the land of his dreams - and succeeds beautifully - by his own will, wits and other merits. A person's financial decisions are deeply personal. 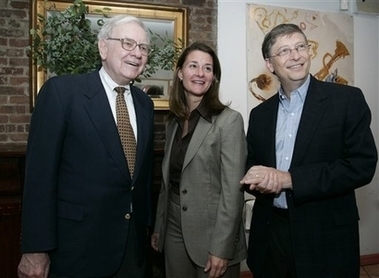 But Buffett and Gates (who recently announced his 2008 retirement to devote time to his foundation) ensure the value they spent their lives generating remain productive within the world and to their own children. There are some things you can learn and other things you must develop a feel for. Marketing's among the latter. You can learn the theory, commit your due diligence to demographics and purchasing habits, and get savvy on all the latest media. But if you haven't got your finger lightly pressed to the pulse of what it truly is to be connected with your consumer, and with what's salient to him or her, and with all the outlets they reach for or that reach for them on a given day, then what have you got? You've got a quantifiable past and, at best, a marginally speculative future. Granted, you can never really tell for sure what's going to catch your audience's fancy. But if you can tap into what's closest to home and do so in an authentic way, you significantly improve your chances. A great marketer needs to remember she's as much a consumer as an accomplice in the sales process. What catches her eye, what stirs a sense of relevance deep inside? How does the product feel in her hand, what does she think of it? Our senses are an immense resource, and they can only add to the numbers we've written out, looked up and stored in the banks of memory. Due diligence is a critical aspect of the profession. It keeps us out of a lot of trouble, protects us from making ancient mistakes. But one's own experience is also a unique and information-rich resource. Hone your intuition, and you've got a weapon that can't be replicated by any competitor. At the same time, we need to learn to freely cross the line dividing the self-titled "marketer" and consumer. Consumers today are, more than ever, all marketers - they're hawking their lifestyles and opinions off to us, and we're as hungry for their attention as they are for ours. They know now that the images and personalities we wrap around their products are reflections of themselves - and they want to contribute to the canvas. I can't think of a more exciting time for the profession. "You went to school to study media manipulation?" a Berkeley, CA bum once barked after hearing I was a marketing and communications student. "We're homeless and we manipulate the media all the time!" I need to hand it to the guy for being so clear-sighted. The Berkeley homeless are notorious for their colourful personalities and curious wares. Teenage kids create street art out of the coins they've gathered. Older staples, like the hat lady with the painted face, are known for the strange stories they tell. I've actually seen Park Avenue couples put shopping bags down and sit on the curb, listening to the hat lady with rapt attention. Homelessness in Berkeley isn't so much a condition as a religion, a movement as politically charged as a commitment to buy all-organic. They're reflections of a tear in time or a glitch in social sentiment that was never quite fixed. Jokemon, a nearby cohort and another of those Berkeley staples, appears to have mastered media manipulation and marketing well. 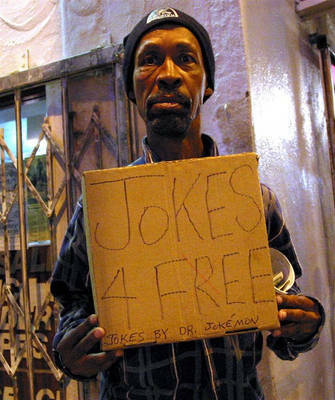 Jokemon, who gives away free jokes (generally rehashing the same one throughout the day), is known for his three-card monty personality, corny punchlines and friendly banter with passers-by. He never begs for money, preferring instead to provide a product or service in exchange for alms rendered. I've seen him at the same street corner on Telegraph throughout my time in college. If he hasn't got something to say, he's got something to put into your hand. And whatever it is, it tends to be self-promoting. "I got one for you I got one for you. What does a gay horse say?" he asks me for perhaps the umpteenth time. I'm sucked in on each occasion. "You told me this one already," I say with a smile, and he waves my protests off with a sly grin, repeating, "What does a gay horse say?" He juts out his hip, flips out a hand and replies, "Ha-aaay." But jokes are hardly Jokemon's sole product. One afternoon he takes my arm and says, "I'm in the paper! Here. Take a copy." Beside him lie a stack of newspapers, neatly folded, with a photo of him sitting at his usual perch, a wooden crate. I can see "Jokemon" written in print somewhere in the headline. I take a copy. Most people do, regardless of whether they actually read them. In another instance, he hands me one of a series of photocopies, also neatly folded beside him, awaiting distribution in a stack. The photocopies came in two iterations. One is a close shot of his face, eyes drifting off to the side. Behind him is a filthy wall with graffiti across it. But it's the other photo that sticks out in my mind: Jokemon lying across the pavement, his hands across his chest like an ancient mummy, making a face at the camera as though he's having a seizure. Meanwhile two cops examine the vivid scrawl across the brick wall behind him: THE REVOLUTION WILL NOT BE TELEVISED. One cop looks down at Jokemon in a reproachful way. I still have the photocopies. Recently I walked by Jokemon and he had shirts, upon which were printed that same image. THE REVOLUTION WILL NOT BE TELEVISED, they whispered from starchy white cotton. "Come on," Jokemon coaxes. He grins at me as always with a familiar intimacy, but that could just be his hustle. "$10 for a shirt. They're fresh made." "I haven't got $10," I say. He makes a face like I'm twisting his arm and says, "All right. For you, $7. What's your size?" "I'll put one on layaway for you." He winks at me and walks off, toting his shirt before the next prospective customer. If he hasn't already (and I wouldn't put it past him), Jokemon's one of those eclectic cats who's going to land an HBO special one day. He can't not. Who knows how many of us have received the pages of self-promoting propaganda and bad jokes he unfailingly disseminated through the years? Who knows how many of us stood and laughed with him on that street corner, knowing full well that he'd be one of the defining memories of Berkeley we'd hold near and pass on? Jokemon is both medium and message, product and purveyor. Cheers to a media master in his own right. Dr. Jokemon on Telegraph Ave. Photo courtesy of Matt Fitt. I finished Ken Kesey's One Flew Over the Cuckoo's Nest yesterday afternoon. Chief Bromden, the looming deaf-mute from the acclaimed 1975 film, charts the arrival of robust, life-loving Randle McMurphy to a mental institution efficiently managed by an entity called the Combine. Catalyzed by McMurphy's humor and friendship, minds long lost in fog slowly remember what it's like to be human beings with valid desires, and what exactly it costs to opt out of the world. The narrative bleeds the reality Bromden witnesses and the nightmare of his own insanity, culminating in a crisp view on the subtle dynamics of good and evil. It's a book that lingers, held fast by the rambling, whimsical prose of the silent witness, the moving complexities of the characters, and a story whose framework we all know well. What is it to be crazy? What is it to be strong? What is it to be alive? Of course it helps to pepper the tale with gambling, hookers and the occasional (well-deserved) drunken binge with the guys. One Flew Over the Cuckoo's Nest comes highly recommended, particularly for those of you who were able to appreciate the Jack Nicholson film. He made the perfect McMurphy.